Spring is an amazing season for engaging students in making observations about the environmental changes happening all around them. New bird species appear, flowers begin to bloom, and trees that were once bereft of leaves are all at once covered in flowers and bright green leaves. Project Learning Tree has an array of hands-on activities you can use to get students outside and making seasonal observations. 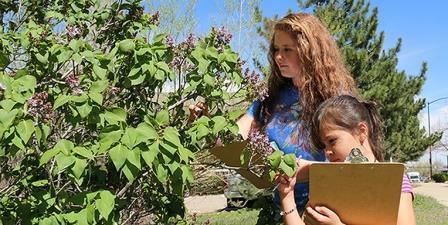 As an enhancement to these activities, a new partnership with Project BudBurst enables students to connect their seasonal observations about plants to those being made all across the country, while contributing to an ongoing citizen science project that began in 2007. Project BudBurst is a network of people across the country that monitors plants as the seasons change. The program engages the public in making careful observations of the phenophases, such as first leafing, first flower, and first fruit ripening of a diversity of local trees, shrubs, flowers, and grasses. That data is in turn used by scientists across the country to make inferences about changing climate trends, plant range information, as well as many other natural connections. Springtime is the perfect time to engage your students in outdoor activities while helping them see how their observations can contribute to a larger body of research. In addition to collecting scientifically useful data, students will understand the impacts of changing climates on plants and their phenology, and engage in and understand the scientific process. PLT activities can help get your students interested in being part of the scientific process by making observations of plants and sharing their data with others through Project BudBurst. It’s an easy addition to the PLT GreenSchools School Site Investigation, as well as many activities in PLT’s PreK-8 Environmental Education Activity Guide, especially Activity 65: Bursting Buds, Activity 64: Looking At Leaves, and later in the year, Activity 78: Signs of Fall. 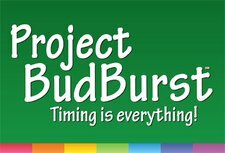 Check out the PLT GreenSchools and Project BudBurst Partnership webpage at http://budburst.org/community-greenschools to access 3 free PLT activities, including Bursting Buds. Plus you’ll find plenty more resources to get your students involved in recording plant observations and learning about phenology and how changes in climate affect a plant’s lifecycle. Once your students record their data in the Project BudBurst database, they will be able to see their data appear on an online map and compare it to other data being recorded in their community and around the country. There is no cost to participate – everything needed is freely accessible on the Project BudBurst web site including Implementation and Classroom Registration Guides, educational resources, materials, and activities for both formal and nonformal K-14 educators and their students. Note: This partnership is a collaborative effort between Project Learning Tree, Project BudBurst, and the U.S. Forest Service who are working together to engage students in citizen science and activities that promote stewardship at their schools and beyond. Almost everyone who attends a PLT in-person workshop praises the experience. In our continual efforts to innovate based on educator needs, PLT offers online professional development for our new e-units, PreK-8 Environmental Education Activity Guide, Environmental Experiences for Early Childhood, as well as GreenSchools. Project Learning Tree continues to develop new online professional development opportunities for educators that are carefully designed to create effective learning experiences.